Chris Taylor is batting .346 so far during the month of August. 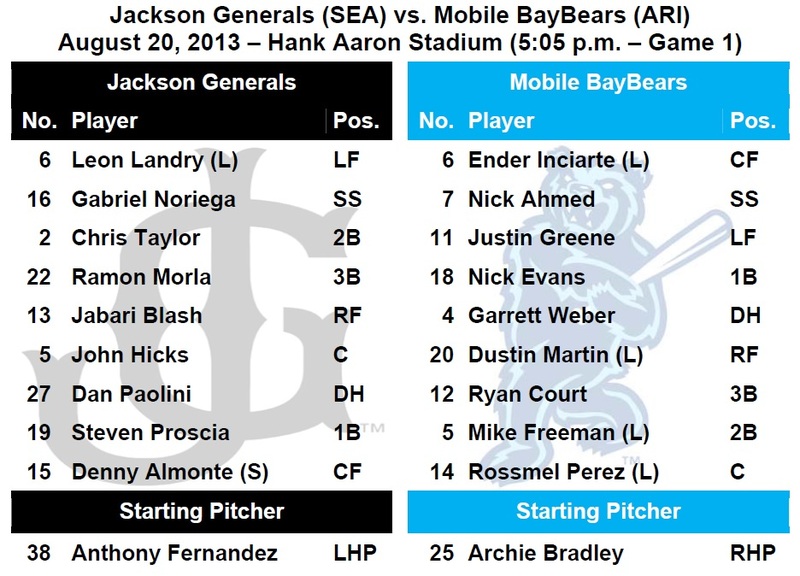 TODAY’S GAME: the Generals continue a 7-game series in 4 days tonight at Mobile (2-2) with the 3rd doubleheader in 3 days…this season Jackson is 6-6 against the BayBears and 3-4 at Hank Aaron Stadium…the Generals went 4-1 during the last homestand and have won 6 of the last 9 series’ and are 18-14 since the All-Star break…Jackson begins the final homestand of the season starting Friday, a 5-game series vs. Chattanooga. GENERALS RECAP: The Generals scored 1 run in the 1st inning and 1 run in the 5th inning, but it wasn’t enough as Jackson lost to Mobile 6-2 in game 1 on Tuesday night. LF Leon Landry (2×3, R, BB), SS Gabriel Noriega (2×4) and 2B Chris Taylor (2×4, RBI), the Generals 1-3 hitters, combined to go 6-for11 with 1 run scored and 2 RBI. Starter Anthony Fernandez (4.0,8,6,6,2,1,HR) recorded his 7th win of the season, allowoing 6 runs on 8 hits in 4.0 innings. RH Tyler Burgoon (2.0,2,0,0,0,1) allowed 2 hit over the final 2.0 scoreless innings in relief. RF Jabari Blash hit a 3-run home run in the top of the 6th to tie the game 4-4, but it wasn’t enough as Mobile defeated Jackson 5-4 in 10 innings. Blash (3×4, R, HR, 3 RBI, BB) led the team with 3 hits, while SS Gabriel Noriega (1×4, BB), 2B Chris Taylor (1×3, 2 R, 2B, 2 BB), 3B Ramon Morla (1×4, R, RBI, BB) and LF Jack Marder (1×4, 2B) each recorded 1 of the Generals 7 hits. Starter Kyle Hunter (3.0,4,4,3,3,5) allowed 4 runs (3 ER) on 4 hits in 3.0 innings, but didn’t figure into the decision. LH Nick Hill (2.0,0,0,0,1,3) and Moises Hernandez (2.0,1,0,0,1,0) combined to hold the BayBears scoreless over 4.0 innings, while RH Stephen Shackleford (2.1,3,1,0,1,1) recorded the loss after allowing an unearned run to score in the bottom of the 10th inning with 1 out. NEWS & NOTES: 42 of 122 games have been 1-run games (18-24) which is the 8th in all of minors…61 of 122 games have been decided by 2-or-fewer runs (23-37) and 15 have been extra-inning games (5-10)…In games decided by 3+ runs the Generals are 32-26. • THE RELIEVING MA-SCHEEN RH Stephen Kohlscheen has allowed only 3 earned runs over his last 26.0 innings (1.04 ERA). During this 14-game stretch (since June 26), he is 5-0 while lowering his season ERA from 3.60 to 2.78. • ON THE ROAD AGAIN: The Generals are making their 2nd trip to Mobile in 2 weeks and playing 7 games in 4 days including the resuming of a suspended game and 3 doubleheaders in 3 days. 10 of Jackson’s final 15 games will come on the road. • OFF WITH A BLASH: OF Jabari Blash has a hit in 10 of his first 16 Double-A games batting .276 (16×58) with 5 of his 16 hits being home runs. Blash belted a homer in his first Jackson at-bat on August 2 at Mobile…hit 2 home runs vs. Montgomery on August 15. He leads the Mariners farm system with 21 long balls this season. • SOUTH DIVISION SUCCESS: The Generals are 31-29 this season against teams from the South Division as opposed to 26-36 when facing the North. Of the remaining 15 games, 5 are against South Division foes. • TAYLOR HAVING A GREAT AUGUST: INF Chris Taylor is batting .346 (27×78) with 15 runs scored, 2 doubles, 1 triple, 6 RBI, 10 walks and 5 stolen bases in 20 games in August. • DOUBLEHEADER BLUES: The Generals lead the Southern League having played 16 doubleheaders this season and are 12-12 in 7-inning games. Jackson has 3 more scheduled doubleheaders this week in Mobile. • WE GOTCHA!! Jackson catchers lead the SL catching 51.2% of base stealers (62 CS, 121 Att). The next closest is Pensacola which is throwing out 34.7% of base stealers. 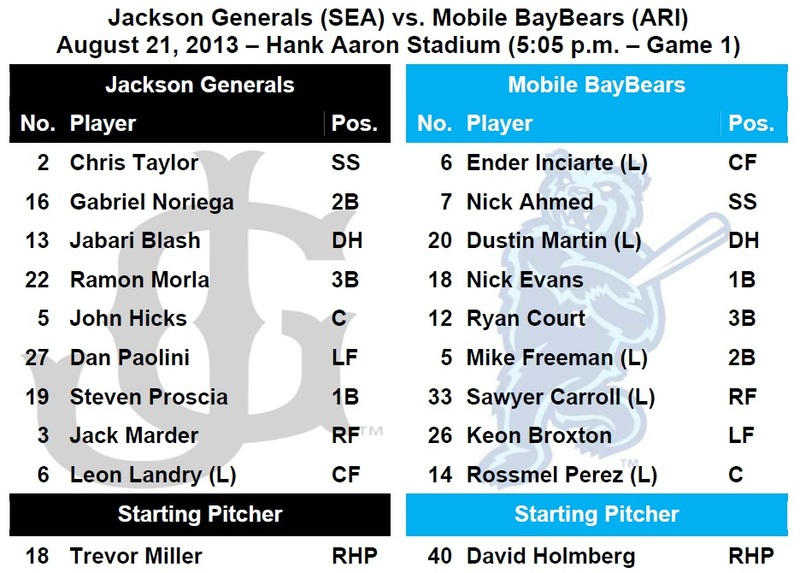 TODAY’S GAME: the Generals continue a 7-game series in 4 days tonight at Mobile with another doubleheader…this season Jackson is 6-4 against the BayBears and 3-2 at Hank Aaron Stadium…the Generals went 4-1 during the last homestand and have won 6 of 7…the Generals have won 6 of the last 9 series’ and are 18-12 since the All-Star break. GENERALS RECAP: 3B Ramon Morla hit a solo home run to lead off the 6th inning to break a 2-2 tie as Jackson defeated Mobile 3-2 in game 1 on Monday night. Morla (2×4, R, HR, 2 RBI), LF Leon Landry (2×3) and SS Chris Taylor (2×3, BB, SB) each led the team with 2 hits. Starter Anthony Vasquez (3.0,2,0,0,0,0) allowed 2 hits over 3.0 scoreless innings, but didn’t figure into the decision. RH Stephen Kohlscheen (2.0,1,2,1,2,1) recorded his 5th win, while RH Carson Smith (2.0,1,0,0,0,2) earned his 13th save after tossing 2.0 scoreless innings. The Generals scored 4 runs combined from the 4th-6th innings to come-from-behind to defeat Mobile 6-3 in game 2. CF Denny Almonte (2×3, R, 2B, RBI), C John Hicks (2×3, 2 R, 2B, 2 RBI, BB), LF Daniel Paolini (2×4) and 2B Gabriel Noriega (2×2, R, 2B, RBI) each recorded 2 of the Generals 11 hits. Starter Jimmy Gillheeney (5.0,8,3,3,1,3) recorded his 6th win of the season, allowing 3 runs on 8 hits in 5.0 innings. RH Stephen Shackleford (1.0,0,0,0,0,0) and RH Dominic Leone (1.0,0,0,0,0,1) combined to hold the BayBears scoreless over the final 2.0 innings in relief. NEWS & NOTES: 41 of 120 games have been 1-run games (18-23) which is the 8th in all of minors…60 of 120 games have been decided by 2-or-fewer runs (23-36) and 14 have been extra-inning games (5-9)…In games decided by 3+ runs the Generals are 32-25. • OFF WITH A BLASH: OF Jabari Blash has a hit in 8 of his first 12 Double-A games batting .262 (11×42) with 4 of his 11 hits being home runs. 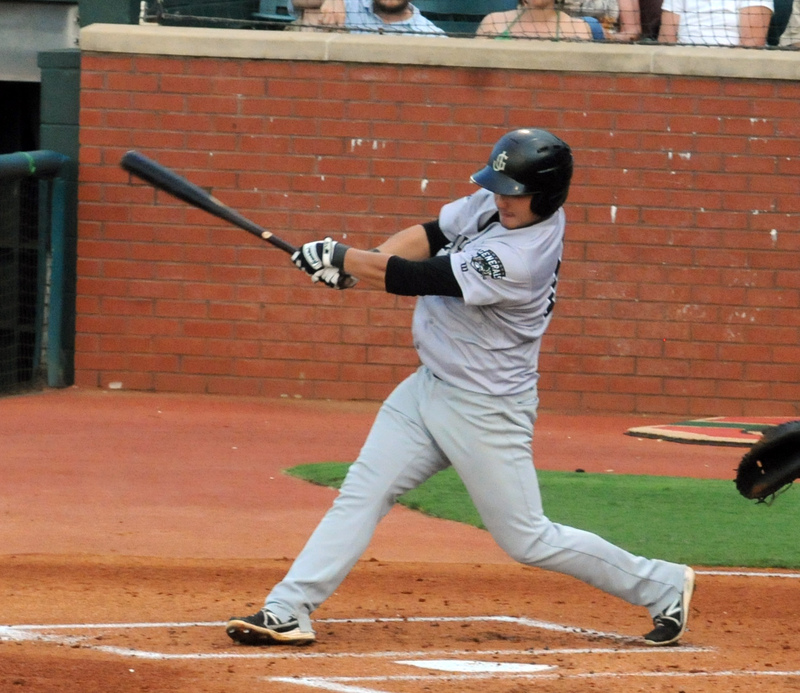 Blash belted a homer in his first Jackson at-bat on August 2 at Mobile…hit 2 home runs vs. Montgomery on August 15. He leads the Mariners farm system with 20 long balls this season. • SOUTH DIVISION SUCCESS: The Generals are 31-27 this season against teams from the South Division as opposed to 26-36 when facing the North. Of the remaining 15 games, 5 are against South Division foes. • TAYLOR HAVING A GREAT AUGUST: INF Chris Taylor is batting .338 (24×71) with 13 runs scored, 1 double, 1 triple, 5 RBI, 8 walks and 5 stolen bases in 18 games in August. • FLYING UNDER THE RADAR: LH Kyle Hunter has held oppoents scoreless in 26 of 31 appearances this season. Overall he is 3-0 with 1 save and a 1.05 ERA (6 ER, 51.2 IP). He has limited opponents to a .220 (42×191), while walking 12 and striking out 37. • DOUBLEHEADER BLUES: The Generals lead the Southern League having played 14 doubleheaders this season and are 10-10 in 7-inning games. Jackson has 3 more scheduled doubleheaders this week in Mobile. Ji-Man Choi was promoted to AAA Tacoma on Monday. 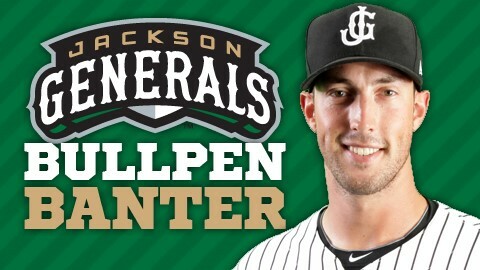 TODAY’S GAME: the Generals open a 7-game series in 4 days tonight at Mobile with the first of 3 doubleheaders…this season Jackson is 4-4 against the BayBears and 1-2 at Hank Aaron Stadium…the Generals went 4-1 during the last homestand…the Generals have won 6 of the last 9 series’ and are 16-12 since the All-Star break. GENERALS RECAP: Yesterday’s game between the Jackson Generals and Mobile BayBears at Hank Aaron Stadium in Mobile, AL was postponed due to torrential rains and unplayable field conditions. 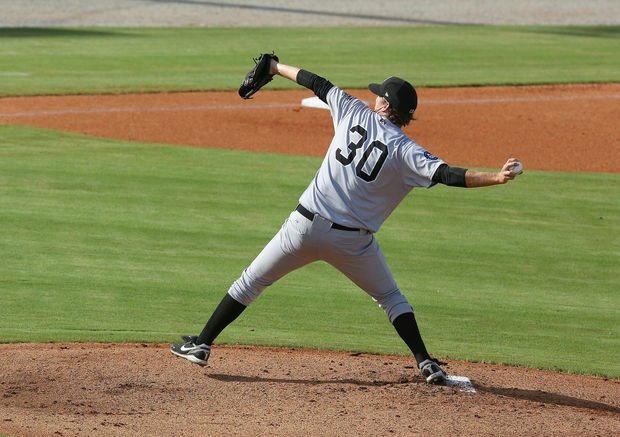 The Generals and BayBears will make up Sunday’s game as part of a doubleheader on Tuesday. The 2 teams will play the conclusion of the August 5 suspended game at 5:05 p.m. on Monday then play a doubleheader on Tuesday and Wednesday starting at 5:05 p.m. each day, weather permitting. The Generals have had 18 games postponed this season, 3 games suspended and 5 games out-right cancelled. The Generals have played 14 doubleheaders. NEWS & NOTES: 40 of 118 games have been 1-run games (17-23) which is the 8th in all of minors…59 of 118 games have been decided by 2-or-fewer runs (22-36) and 14 have been extra-inning games (5-9)…In games decided by 3+ runs the Generals are 32-25. • ALUMNI REPORT: 2009 and 2010 Jackson INF Carlos Triunfel has hit safely in 12 of his last 14 games, batting .357 (20×56) with 9 runs scored, 3 doubles, 3 RBI, 2 walks and 1 stolen base. • ON THE ROAD AGAIN: The Generals are making their 2nd trip to Mobile in 2 weeks and playing 7 games in 4 days including the resuming of a suspended game and 3 doubleheaders in 3 days. Jackson lost 2 of 3 from Mobile August 2-4. • SOUTH DIVISION SUCCESS: The Generals are 29-27 this season against teams from the South Division as opposed to 26-36 when facing the North. Of the remaining 18 games, 8 are against South Division foes. • TAYLOR SETTING THE TABLE: INF Chris Taylor is batting .323 (21×65) with 12 runs scored, 1 double, 1 triple, 4 RBI, 6 walks and 4 stolen bases in 16 games in August. • CLOSING TIME: After allowing 5 runs over his first 6 appearances of the season, RH Carson Smith has allowed only 5 earned runs over his last 33 relief appearances. During this stretch he is 0-1 with 8 saves and a 1.18 ERA (5 ER, 38.2 IP). Since April 22, Smith has lowered his ERA from 8.44 to 2.05. Smith has struck out at least 1 batter in 34 of 39 games (62 strikeouts). • WE GOTCHA!! Jackson catchers lead the SL catching 51.7% of base stealers (62 CS, 120 Att). The next closest is Pensacola which is throwing out 34.7% of base stealers. Chris Taylor collected 3 hits last night in Jackson’s loss. 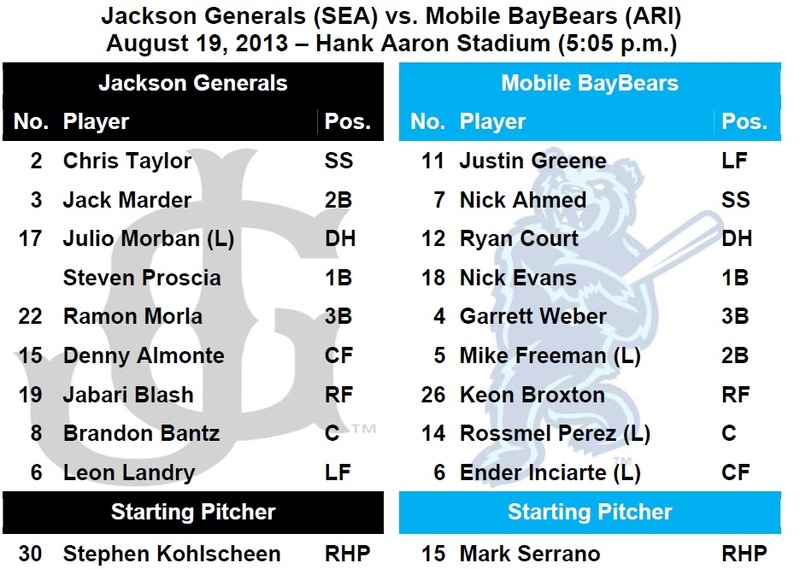 TODAY’S GAME: the Generals open a 7-game series in 5 days tonight at Mobile…this season Jackson is 4-4 against the BayBears and 1-2 at Hank Aaron Stadium…the Generals went 4-1 during the last homestand…the Generals have won 6 of the last 9 series’ and are 16-12 since the All-Star break. GENERALS RECAP: SS Chris Taylor recorded a team-high 3 hits, but it wasn’t enough as Jackson lost to Montgomery 8-2 on Saturday night. Taylor (3×5, RBI) and 1B Ji-Man Choi (2×2, RBI, BB, SB) each recorded multi-hit games, while 3B Ramon Morla (1×4, R, 3B) and 2B Jack Marder (1×4) each had 1 of the Generals 8 hits. Starter Anthony Vasquez (5.0,7,6,6,4,3,2HR) recorded his 3rd loss of the season, allowing 6 runs on 7 hits in 5.0 innings. RH Moises Hernandez (3.0,4,2,2,1,1) allowed a run in each the 7th and 8th innings, while LH Kyle Hunter (1.0,1,0,0,0,1) tossed a scoreless 9th inning. • ALUMNI REPORT: Former General Carlos Peguero hit a walk-off grand slam with 1 out as Tacoma came-from-behind to defeat Colorado Springs 5-3 on Saturday night. Forrest Snow was promoted to Tacoma yesterday and pitched 2.0 innings and earned win. • ON THE ROAD AGAIN: The Generals are making their 2nd trip to Mobile in 2 weeks and playing 7 games in 5 days including the resuming of a suspended game. Jackson lost 2 of 3 from Mobile August 2-4. • DOUBLEHEADER BLUES: The Generals lead the Southern League having played 14 doubleheaders this season and are 10-10 in 7-inning games. Jackson has 2 more scheduled doubleheaders set for August 19 and August 21 at Mobile. • WE GOTCHA!! Jackson catchers lead the SL catching 52.5% of base stealers (62 CS, 118 Att). The next closest is Pensacola which is throwing out 34.2% of base stealers. Former Mariners catcher Dan Wilson made a special visit to Jackson this week and he sat down for Saturday’s edition of Generals OnDeck. Wilson serves as a special instructor working with catchers as well as being a analyst for Mariners games on TV and radio. WIlson talks about former Jackson catcher Mike Zunino, the current group of catchers, his career and playing in the Southern League. Watch the full video below. Leon Landry scored the game-winning run in the 8th inning last night. 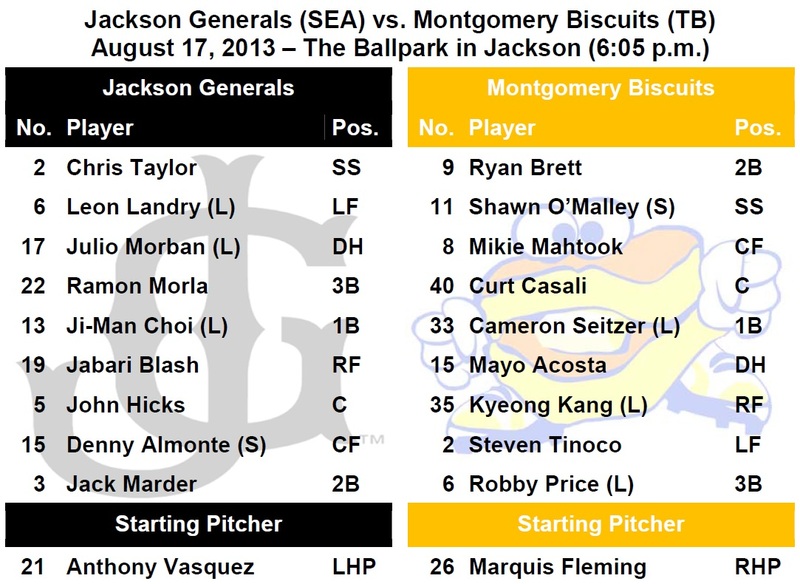 TODAY’S GAME: the Generals conclude their second-to-last homestand of the season tonight looking for a 5-game sweep of the Montgomery Biscuits (4-0) It would be Jackson’s first 5G sweep of a series since 5/14-5/18 of 2011 vs. HVL. The Generals are 10-4 against the Rays’ AA affiliate this season and 7-2 at The Ballpark in Jackson…the Generals have won 6 of the last 9 series’ and are 16-11 since the All-Star break. 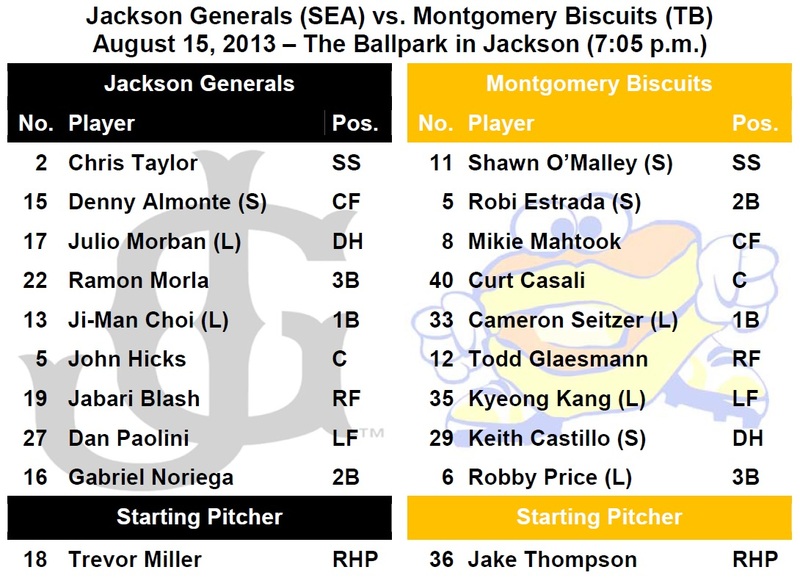 GENERALS RECAP: Despite being limited to only 2 hits, Jackson defeated Montgomery 2-1 on Friday night. 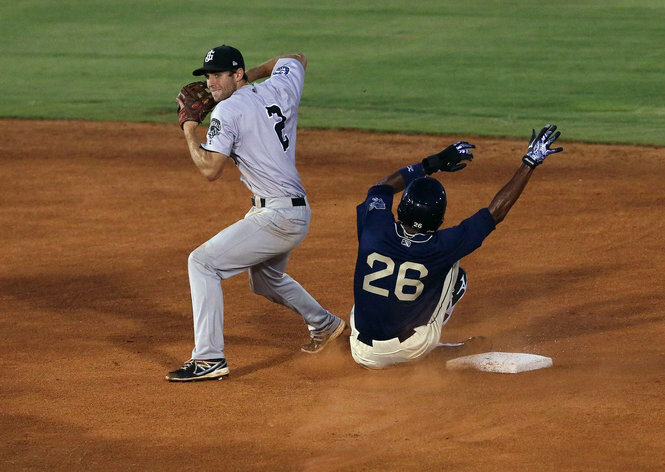 The Generals scored the go-ahead run on a fielding error in the 8th. The win marked the 7th straight home win for the Generals, while matching a season-high 4-game win streak. CF Leon Landry (1×2, R, RBI, BB) recored the Generals first run with a RBI single in the 2nd inning and scored the winning run in the 8th. 1B Ji-Man Choi (1×3, R, BB) reorded the team’s only other hit. 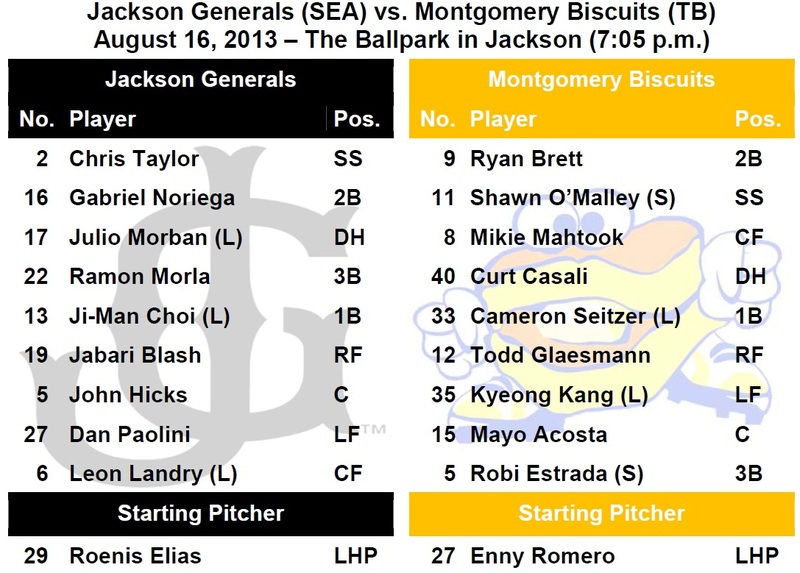 Starter Roenis Elias (7.0,8,1,1,1,6) limited the Biscuits to only 1 run while striking out 6 in a no decision. RH Stephen Kohlscheen (1.0,0,0,0,1,1) tossed a scoreless 7th inning to pick up his 6th win of the season, while RH Dominic Leone (1.0,0,0,0,0,1) tossed a 1-2-3 9th inning to earn his 3rd save with Jackson. NEWS & NOTES: 40 of 117 games have been 1-run games (17-23) which is the 8th in all of minors…59 of 116 games have been decided by 2-or-fewer runs (22-36) and 14 have been extra-inning games (5-9)…In games decided by 3+ runs the Generals are 32-24. • ALUMNI REPORT: Mariners rookie second baseman and former General Nick Franklin has joined twitter, and you can follow him at @NickFrank20…Franklin is also on Instagram (@NicholaseFrank). • WINNING STREAK INFORMATION: The Generals have tied a season-high (3 times) by winning 4 straight games. The last 5-game winning streak was part of a 6-game winning streak, April 23-April 28, 2012 against Huntsville and Tennessee. The last 5-game sweep in a series was May 14-May 18 at home against Huntsville in 2011. That was part of a 7-game winning streak. • HOME SWEET HOME: Prior to July 30 the Generals were 21-30 at home this season, but since then Jackson is 7-0 in their last 7 home games at The Ballpark in Jackson. During that stretch the Generals have out-scored opposition 40-14. • OFF WITH A BLASH: OF Jabari Blash has a hit in 8 of his first 11 Double-A games batting .262 (11×42) with 4 of his 11 hits being home runs. 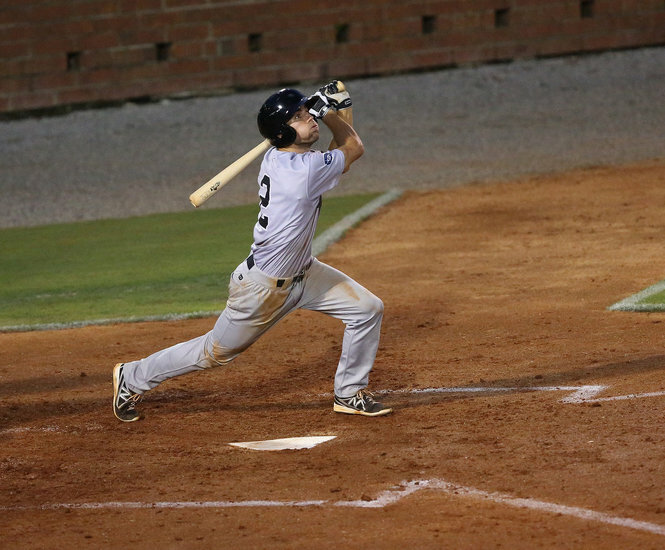 Blash belted a homer in his first Jackson at-bat on August 2 at Mobile…hit 2 home runs vs. Montgomery on August 15. He leads the Mariners farm system with 20 long balls this season. • SOUTH DIVISION SUCCESS: The Generals are 29-26 this season against teams from the South Division as opposed to 26-36 when facing the North. Of the remaining 18 games, 8 are against South Division foes. • TAYLOR SETTING THE TABLE: INF Chris Taylor is batting .300 (18×60) with 12 runs scored, 1 double, 1 triple, 3 RBI, 6 walks and 4 stolen bases in 15 games in August. • FLYING UNDER THE RADAR: LH Kyle Hunter has held opponents scoreless in 25 of 30 relief appearances this season. Overall he is 3-0 with 1 save and a 1.07 ERA (6 ER, 49.2 IP). He has limited opponents to a .219 (41×187), while walking 12 and striking out 36. • TRIPLES ADDING UP: OF James Jones recorded his league-leading 10th triple on July 24th in Chattanooga. He is 1 triple away from tying the franchise record. Jones is tied with Richard Lewis (10, ‘04) and Chris Walker (10, ‘06). Dwaine Bacon (11, ‘04) and Bo Porter (11. ‘98) are leaders. As a team the Generals have 34 triples which is 2nd-most in the Southern League. Again in 2013, Forrest Snow is involved MiLB.com’s Moniker Madness contest. On this addition of Bullpen Banter Snow talks it over with fellow contestant Jabari Blash. Place your vote by clicking on this link. But, watch the video first. Jabari Blash has 4 home runs in his first 10 games in Double-A. TODAY’S GAME: the Generals continue their second-to-last homestand of the season tonight with game #4 of a 5-game series with the Montgomery Biscuits (3-0). The Generals are 9-4 against the Rays’ AA affiliate this season and 6-2 at The Ballpark in Jackson…the Generals have won 6 of the last 9 series’ and are 15-11 since the All-Star break. GENERALS RECAP: The Generals scored 6 runs in the bottom of the 2nd inning and Jackson cruised to a 10-1 win over Mongomery on Thursday night. RF Jabari Blash (3×4, 3 R, 2 HR, 3 RBI, BB) hit 2 home runs and drove in a team-high 3 runs. 2B Gabriel Noriega (3×4, 2 R), DH Julio Morban (2×4, 2 R HR, 2 RBI, BB), 3B Ramon Morla (2×5, R, 2 RBI) and 1B Ji-Man Choi (2×5, 2B, 2 RBI) each record mult-hit games. Starter Trevor Miller (5.0,5,1,0,3,2) recorded his 2nd AA win, allowing 1 run (o ER) on 5 hits in 5.0 innings. RH Forrest Snow (2.0,0,0,0,1,2), RH Stephen Shackleford (1.0,1,0,0,0,1) and RH Moises Hernandez (1.0,1,0,0,2,0) combined to hold the Biscuits scoreless over the final 4.0 innings in relief. NEWS & NOTES: 39 of first 116 games have been 1-run games (16-23) which is the 9th in all of minors…58 of 116 games have been decided by 2-or-fewer runs (21-36) and 14 have been extra-inning games (5-9)…In games decided by 3+ runs the Generals are 32-24. • ALUMNI REPORT: Taijuan Walker (5.1,4,5,5,4,9,HR) recorded his 3rd loss with Tacoma last night at Round Rock, allowing 5 runs on 4 hits in 5.1 innings. Overall he is 3-3 with a 4.27 ERA (22 ER, 46.1 IP) in 9 starts with Tacoma. • HOME SWEET HOME: Prior to July 30 the Generals were 21-30 at home this season, but since then Jackson is 6-0 in their last 6 home games at The Ballpark in Jackson. During that stretch the Generals have out-scored opposition 38-13. • OFF WITH A BLASH: OF Jabari Blash has a hit in 8 of his first 10 Double-A games batting .282 (11×39) with 4 of his 11 hits being home runs. Blash belted a homer in his first Jackson at-bat on August 2 at Mobile…hit 2 home runs vs. Montgomery on August 15. He leads the Mariners farm system with 20 long balls this season. • SOUTH DIVISION SUCCESS: The Generals are 28-26 this season against teams from the South Division as opposed to 26-36 when facing the North. Of the remaining 19 games, 9 are against South Division foes. • TAYLOR SETTING THE TABLE: INF Chris Taylor is batting .316 (18×57) with 12 runs scored, 1 double, 1 triple, 3 RBI, 5 walks and 4 stolen bases in 14 games in August. • 17 GAMES IN 15 DAYS: The Generals began a stretch of 17 games in 15 days last night. Jackson will play 7 games in 5 days in Mobile starting on Sunday including the conclusion of a suspended game. The Generals close out the season playing 22 games in 22 days which includes 12 road games and 10 home games. • WE GOTCHA!! Jackson catchers lead the SL catching 52.6% of base stealers (61 CS, 116 Att). The next closest is Pensacola which is throwing out 33.8% of base stealers. 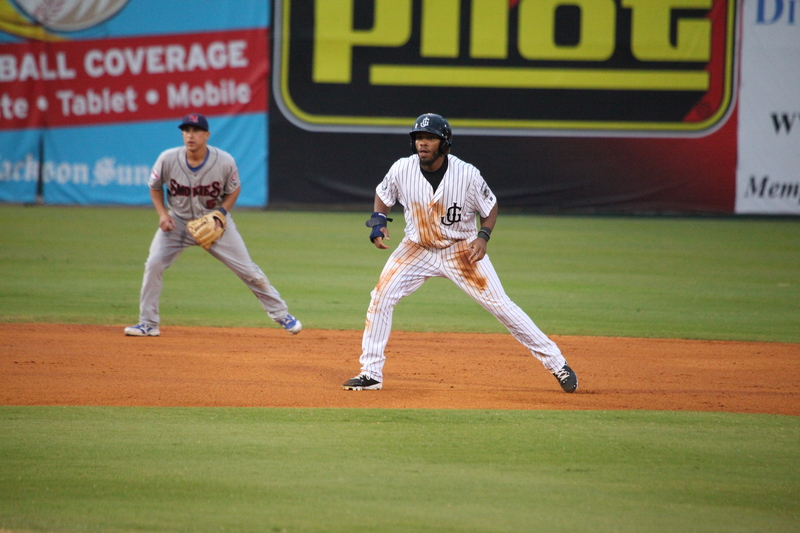 Tonight’s Generals OnDeck features outfielder Denny Almonte. He logged his first three-hit game of the season last night in Jackson’s 9-5 win over Montgomery. Almonte is a leader in the clubhouse among America and Latin players. He talks about being bilingual and translating for teammates. He also discusses the nicknames he has picked up so far in his pro career. Ramon Morla belted his 2nd grand slam of the season in last night’s win. TODAY’S GAME: the Generals continue their second-to-last homestand of the season tonight with game #3 of a 5-game series with the Montgomery Biscuits (2-0). The Generals are 8-4 against the Rays’ AA affiliate this season and 5-2 at The Ballpark in Jackson…the Generals are coming off a 4-6 road trip and are currently 6.0 games back, in 3rd place in the Southern League North Division standings. GENERALS RECAP: 3B Ramon Morla hit a grand slam home run with 2 outs in the 7th inning to lead Jackson to a 9-5 win over Montgomery on Wednesday night. CF Denny Almonte (3×4, 2 R, 2B) led the team with 3 hits, while Morla (2×4, 2 R, 2B, HR, 4 RBI) and SS Gabriel Noriega (2×3, 2 R, 3B, RBI) each recorded 2 of the team’s 11 hits. Starter Anthony Fernandez (6.0,6,2,2,1,4) recorded his team-leading 9th win of the season, allowing 2 runs on 6 hits in 6.0 innings. RH Stephen Shackleford (1.0,0,0,0,0,0) tossed a 1-2-3 7th inning, while RH Tyler Burgoon (1.0,1,2,2,1,0) and RH Dominic Leone (1.0,1,1,1,0,1,HR) combined to allow 2 runs over the final 2.0 innings in relief. NEWS & NOTES: 39 of first 115 games have been 1-run games (16-23) which is the 8th in all of minors…58 of 115 games have been decided by 2-or-fewer runs (21-36) and 14 have been extra-inning games (5-9)…In games decided by 3+ runs the Generals are 31-24. • ALUMNI REPORT: Yes, more from Brad Miller… Miller hit his 5th triple of the season last night for Seattle, in just his 40th career game…Miller leads the American League rookie class in triples (8th with 17 extra base hits) and ranks T4th in the AL overall in triples…his 5 triples in first 40 career games tie the club record held by Ichiro (2001) and Dustin Ackley (2011). • GRAND SALAMI TIME: Ramon Morla blasted Jackson’s 5th grand slam of the season in the 7th inning on August 14. The Generals lead the Southern League in grand slams with 2 coming from Morla, 2 from Ji-Man Choi and 1 from Brad Miller. • TAYLOR SETTING THE TABLE: INF Chris Taylor is batting .309 (17×55) with 11 runs scored, 1 double, 1 triple, 2 RBI, 3 walks and 4 stolen bases in 13 games in August. 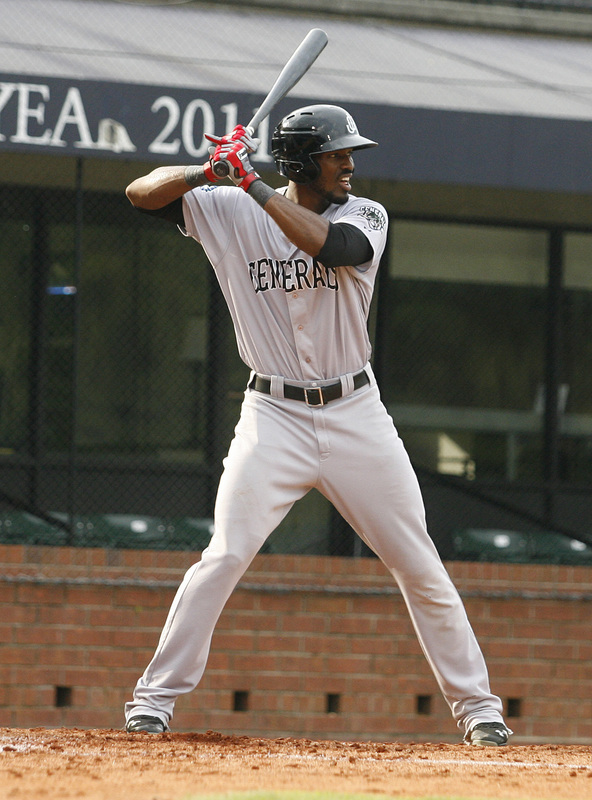 • OFF WITH A BLASH: OF Jabari Blash belted a solo home run in the 2nd inning on August 3rd in his first AA at-bat. He joins Tennessee’s Javier Baez as the only Southern League player this year to homer in their AA debut this season. Blash had a hit in each of his first 6 Double-A games and 7 of his firs 8. Blash also homered in his 2nd home at-bat on August 13 vs. Montgomery.